I have visited many cities in the past, but one of the cities that really stands out is Florence, Italy. I went there on a school trip when I was 16. One of my favourite memories of that particular trip is the visit to the famous Piazzale Michelangelo square, from where we could see the whole city. After that trip, I’ve always made sure I researched the possibility of duplicating that experience in other cities I planned to visit. When I started to make plans for my trip to London, the obvious choice seemed to be the country’s tallest building, which had not yet been completed the last time I visited London. During that trip in 2011, I had seen The City from St. Paul’s cathedral and admired Canary Wharf’s skyscrapers from the hill in Greenwich Park. The Shard, very close to the river Thames, is now finished and the view from the 72nd floor was bound to be stunning. The only drawback was the ticket price. Not planning on spending that much money, I decided to investigate the alternatives. Soon after my arrival in the British capital it became clear that I hadn’t done my research well enough. 20 Fenchurch Street, a skyscraper best known as the Walkie-Talkie building, was located just around the corner from my hotel. I had planned to visit the Sky Garden at the top of the building. It doesn’t cost any money, but does need to be booked in advance. On the first day of my trip, I realised that the following two weeks were already fully booked, which meant I would have to come up with another alternative. I briefly considered Up at The O2, the walkway over the roof of the O2 arena, where I would be attending a concert in the second week of my trip. The idea was quickly dismissed as I didn’t really want to spend that much money. Tired of trying to find an alternative, I got caught up in the other places I wanted to visit and forgot all about it, until the end of my trip. From the window of my hotel room on the fifth floor, I could see the Thames. It was the last day of my trip and as I was packing my suitcase, the skyscraper across the river kept catching my eye. I finally gave in and looked up the weather forecast. I had watched a couple of stunning sunsets from the nearby Tower Bridge in the previous two weeks. Clear weather was predicted for the rest of the day. Despite the ridiculously high price, I decided to splurge on a ticket for The View from The Shard, because I knew I’d regret it if I didn’t. In an attempt to get the most value for my money, I arrived at the building roughly one hour before sundown. Surprisingly, I had the lifts all to myself as they quickly took me to the 68th level, with a quick stop on the 33rd to change lifts. The moment I reached the main gallery at level 69, I was floored by the view through the floor-to-ceiling windows. 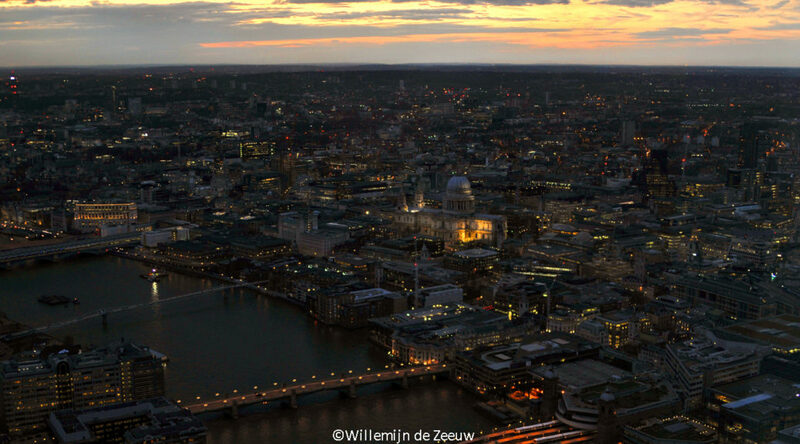 I never realised just how large London is until I saw it from the top of Western Europe’s tallest building. The weather was not as clear as I’d thought, and it was impossible to see the edges of the city. Despite that, the view was incredible. I had a lot of fun discovering all the iconic buildings around me, from nearby ones such as Tower Bridge and the skyscrapers of The City, to the distant arch of Wembley stadium. Mesmerised by the view – a feeling that was enhanced by the soft symphonic music that could be heard – I took out my camera to capture it, only to be hugely disappointed by the way the reflections in the glass ruined every single photo; of course I had forgotten to bring my polarising filter. I sat down on the floor and watched the traffic for a while. Especially the trains were fun to watch, as their movements look surprisingly elegant from this high up. After a while, just before the sun began to set, I decided to take the stairs to the 72nd level. Obviously, the view isn’t much different there, but I was pleased to find out that there was no ceiling. Instead, the building opens up to the sky, and thanks to the low temperature, most people seemed to stay on the other level, allowing me to watch the sunset undisturbed. The experience was made extra surreal by the realisation that the planes passing overhead were louder than the noise of the city, which was blocked by the glass. The lights had been switched off and combined with the soft light of the sunset, that made it much easier to take photos. I watched the day morph into night and completely lost track of time. The sunset may not have been as spectacular as I’d hoped, but I couldn’t have been happier about my decision to splurge on a ticket. Nothing else could have made for a more fitting finale to my stay in London. Right then and there, I knew that this was one of the most special moments of my trip. I knew I would miss this when I got home. And I do. In fact, as soon as the lifts took me back down after more than two and a half hours, I already missed the view.